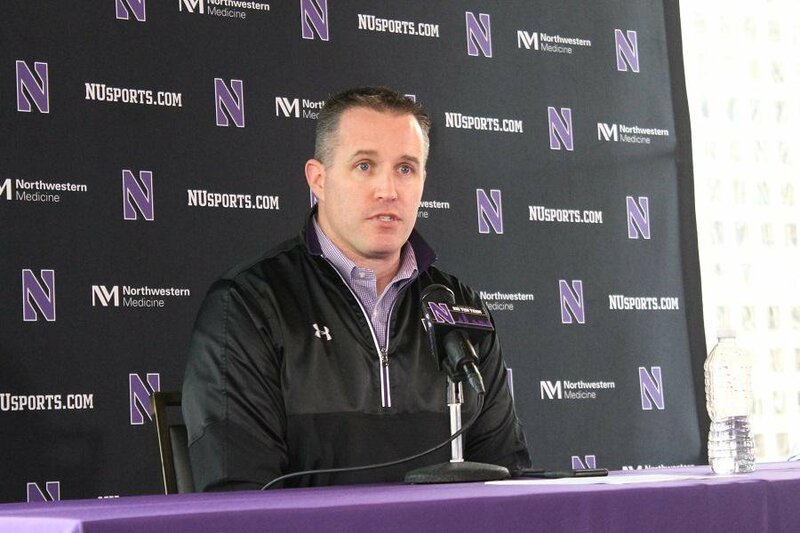 Pat Fitzgerald talks about his recruiting class during last year's signing day. Fitzgerald and Northwestern signed 18 new recruits on Wednesday. Sixteen recruits with scholarships and two walk-ons signed letters of intent Wednesday to enroll in Northwestern in the fall, composing the majority of the Wildcats’ 2018 recruiting class that will be completed by Feb. 1. Of the 18 total signees, 10 are offensive players and seven are from the state of Illinois, up from just two last year. “We’re trying to find a specific fit academically, obviously football-wise (talent) that’s going to help us compete for a championship, and then the character too that keeps it glued together,” coach Pat Fitzgerald said. The headliner of the group is four-star defensive end Devin O’Rourke, ranked the second-best recruit in the state of Illinois by 247Sports. In O’Rourke, Fitzgerald said he sees a pass rusher that reminds him of former NU star-turned-NFL starter Dean Lowry. O’Rourke, who is listed at 6-foot-6, 241 pounds and said he also wrestles in high school, told The Daily last spring that his decision between the Cats and Illinois was very close, with NU’s location and academics ultimately winning him over. That trend of the Cats out-recruiting their in-state Big Ten rivals was evident throughout the 2018 class: NU landed five of the top 16 players in the state (according to ESPN’s rankings), while Illinois nabbed just one. Fitzgerald, however, said he pays little attention to the third-party recruit ranking systems, which generally rank the Cats’ recruiting classes near the bottom of the conference and did so again this winter. Other players to watch among Wednesday’s signees include offensive lineman Wyatt Blake and quarterback Jason Whittaker, who — along with O’Rourke — make up the top of the class according to ESPN. Longtime NU fans will also recognize the last names of running back Drake Anderson and superback Brian Kaiser, both of whom are the sons of former Cats players. The only true surprises in Wednesday’s announcement, though, were offensive linemen Willy Boatman and receiver Raymond Niro, two preferred walk-ons who hadn’t previously been listed on the team’s commitments pages. But the fun isn’t done yet. High school players set to graduate this coming spring have until February 1 to sign national letters of intent, and the Cats’ class is likely to add a few more members before that date.